A “cold connection" is any method of attaching or connecting two or more pieces together without the use of heat (soldering, brazing or welding). This method is usually needed when the pieces to attach can be damage by the heat and flame of a torch. “Cold connections” can also be used as decorative elements. In this tutorial metal tubing is used in a non-traditional way. The tubing is flared and compressed to trap another piece of metal, avoiding the use of solder. This is a cold connection. 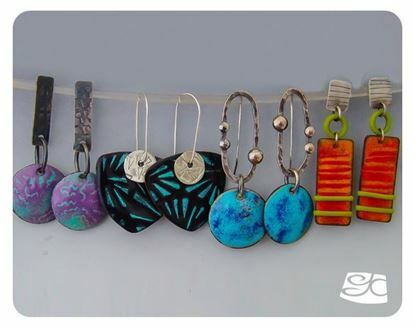 These hand formed boldly colored and textured earrings are original and easy to make. This tutorial is an instant downloading PDF file, it has 10 pages, a template, 20 photos and plenty of tips. The tutorial is for beginner’s students. In this tutorial we will be constructing a split bezel & tab setting for a straight sided, angular shape. The flat shape will be made out of a multicolored piece of polymer clay. 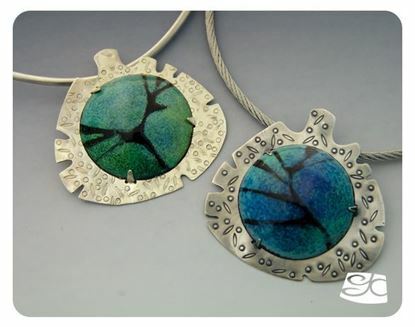 As an alternative you can substitute the polymer piece for a torch fired enamel piece. The project can also be turned into a solder-less piece using "cold connections “. 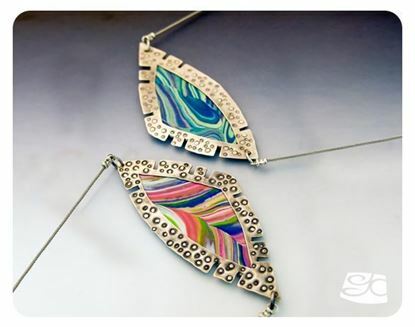 The instructions for a customized stainless steel cable necklace with matching clasp are also included in the step-by-step instructions. The tutorial is an instant downloading PDF file, it has 11 pages, 29 photos, a life size template of all the components and plenty of tips! For beginner skill students. 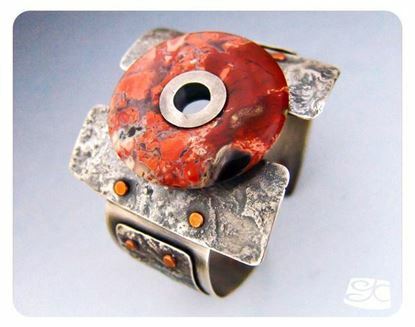 Reticulated silver over copper cuff with foldformed cabochon. Reticulation is a process in which silver is made to buckle in to ridges and valleys adding a very interesting and strong surface texture to the metal. 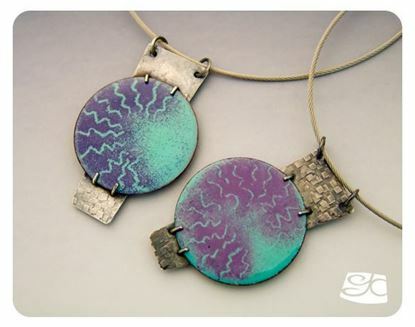 This method produces one-of-a-kind pieces, very dramatic and organic looking. Foldforming, a relatively new way of manipulating metal is another technique that gives a very interesting surface to metal. 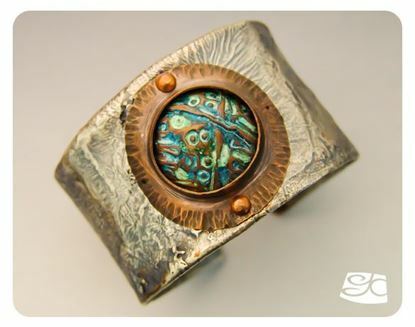 Our cuff will have as a focal piece a foldformed cabochon, treated with chemical patinas to achieve a deep rich blue-green color. 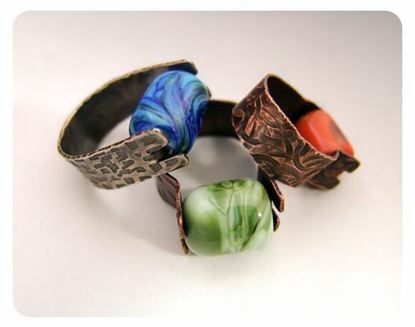 The cabochon will be attached with a riveted setting onto the reticulated cuff. This is a perfect project to recycle all your sterling silver scraps cutouts. This is a project for the intermediate to advanced student. It requires the use of an acetylene torch with a big tip. The tutorial is an instant downloading PDF file, it has 18 pages, 59 photos and plenty of tips! 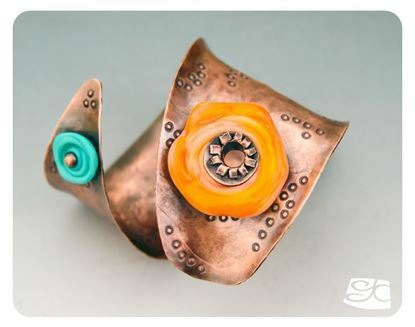 Nothing beats a piece of jewelry that has interchangeable parts! And if you are the one making the parts, even better! You can make as many different ones as you want: change the shape, choose the colors of the piece to match your wardrobe. The possibilities are endless! This tutorial is an instant downloading PDF file, it has 8 pages, 24 photos, a template and plenty of tips. The tutorial is for intermediate and advance students. Foldforming is a technique that lets you turn a flat sheet of metal into a three dimensional object. This way of manipulating sheet metal can also add a lot of texture to it. In this tutorial we will fold a piece of metal sheet many times to give it a eye catching texture. We will add to this texture with stamped designs intermixed with the folds. Once finished with the textured metal sheet we will cut out and shape a pair of round cabochons and a tear-shaped one. The cabochons will then be framed in sterling silver using a combination bezel-tab setting for a spectacular set of earrings and pendant. 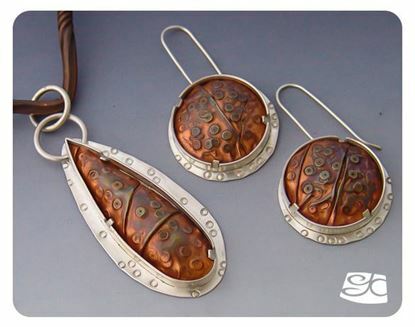 The step-by-step instructions includes how to apply and preserve colored patinas for a different look on the copper cabochons. This tutorial is an instant downloading PDF file. It has 16 pages, 54 photos and life size template of all the components. For intermediate skill students. Tear Sterling silver and corrugated copper earrings Corrugation is a method of producing parallel pleats onto a flat sheet of material, in our case sheet metal. 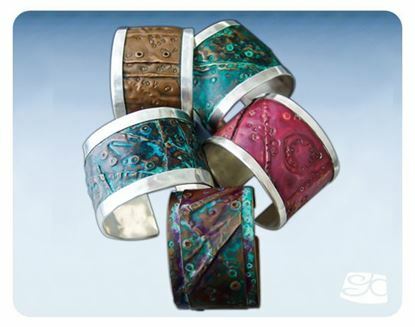 The deep texture of corrugated metal ads a great deal of visual interest to a piece of jewelry. Those deep pleated folds are also very good at holding colored patinas to enhance the design even more. This tutorial is an instant downloading PDF file, it has 13 pages and 43 photos. The tutorial is for beginner’s students with some soldering experience. But it can be easily modified to be a solderless project. Tabs are small tongues cut into sheet metal that when folded or wrapped around an object can attach it to the metal sheet. Tabs are one of the simplest “cold connections “. 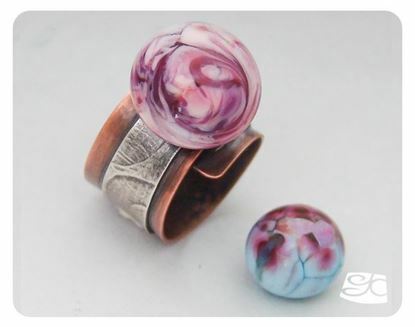 In this project we will use them to set a small cylindrical bead on to a wide textured ring band. This tutorial is an instant downloading PDF file, it has 5 pages, 14 photos, a template and plenty of tips. The tutorial is for beginners and intermediate students. Sterling silver cuff with foldformed insert & patina application Make a unique bold sterling silver cuff with a rich colored patina fold- formed insert. The tutorial is an instant downloading PDF file, it has 7 pages, 19 photos, a template and plenty of tips! 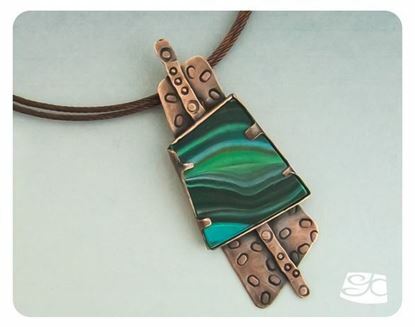 This project will guide you in the making of a simple yet striking reversible sterling silver and polymer clay one-of-a-kind pendant. This is a perfect beginners project. Is a good introduction to working with polymer clay. It covers basic instructions on: how to condition polymer clay, what tools to use, making a multicolored slab, cutting the clay and baking it in the oven. Also it goes over basic metal fabrication skills as cutting with a jeweler's saw, filing and sanding. 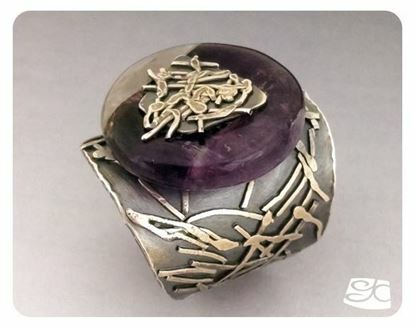 Decorative stamping and patina application are also covered. 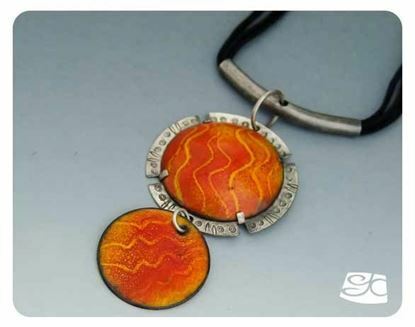 The step-by-step instruction will walk you through the making of a simple polymer clay flat multicolored cabochon piece. 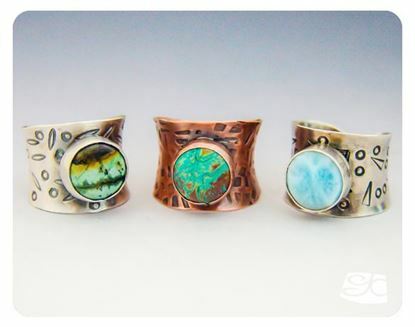 Then go on to show you how to make a sterling silver frame, and tab-setting your cabochon. 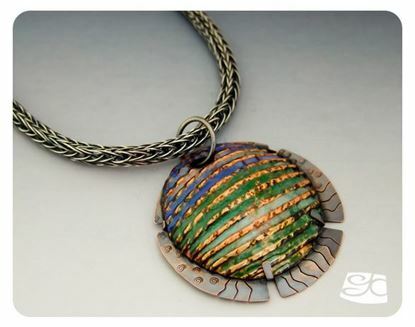 The final instructions will cover how to make a stainless steel cable necklace for your finished pendant. This tutorial is an instant downloading PDF file. It has 8 pages, 21 photos and life size template of all the components. For beginner skill students. 4 in 1 Tutorial. 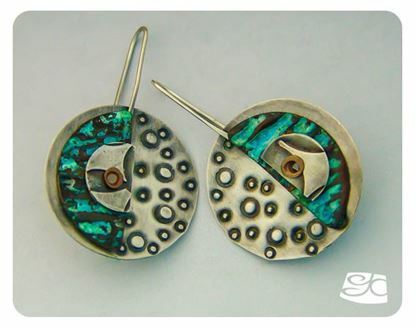 Beautiful torch fired earrings. This tutorial is an instant downloading PDF file, it has 14 pages, 4 templates and 45 photos. Most of the projects are for beginners and intermediate skill students.